Classical realism oil on canvas still life of fruits , ACEO , “Nobody’s perfect” . I’m in a some kind of fruity mood and I’m painting and painting more and more classical realism paintings of fruit, still life. Nothing ‘s wrong on this only that it’s unusual for me, a former abstractionist artist and still a surrealist painter … Am I still a surrealist artist? I think so. 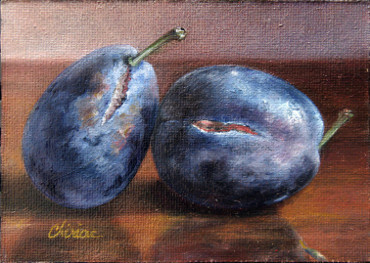 Here’s another painting of fruit still life ACEO I made this days.